"The Prisoner" has been mentioned several times on British television recently, in distinctly different circumstances. Firstly, on the "Richard and Judy" C4 chatshow on July 6th. Cast members from the TV series "Lost" were being interviewed, and presenter Richard Madeley made a comparison between the 2 series. Unfortunately, none of the guests had ever heard of it leading to Madeley, rather unsuccessfully, trying to explain it to them. 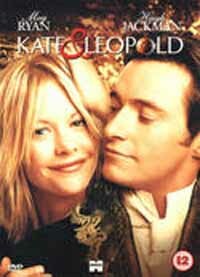 Secondly, a showing of the romantic time travel movie "Kate and Leopold" (left) reminded us that "The Prisoner" is seen on a TV during one scene of the film. Thirdly, the series was briefly mentioned during the BBC3 commentary to the recent "Doctor Who" episode "Doomsday". In a conversation between writer/producer Russell T Davies and designer Matt Savage it was remarked "the sphere was originally white - very Prisoner". Finally, "Which Number was assigned to Patrick McGoohan in the TV series The Prisoner?" appeared as a question on the Ant and Dec ITV1 gameshow "Pokerface" on July 14th. With thanks to Paul Smith, Frank Shailes, and Mastrid for this news item.